factory—increasing equipment use, improving workflows and optimizing supply chains. By understanding how the IIoT can deliver better business outcomes, manufacturers and other participants in the value chain can reduce costs, improve product and service quality, reduce time-to-market, increase agility and better engage with their customers and suppliers, all of which leads to significant competitive advantages in today’s digital economy. One of the most important ways that the IIoT can improve business outcomes is by enabling manufacturers to secure, analyze and use data from their factory equipment to create “smart factories” with orchestrated and efficient operations. Specifically, manufacturers can deploy IIoT solutions that integrate IoT devices into their factory equipment and use cellular and other wireless technologies to collect and analyze data from these devices. The data is then transmitted to manufacturing-execution and quality-management systems to be combined with other factory data to deliver insights for optimizing performance across all of their factory’s manufacturing activities. Mitigate operating risks by identifying equipment problems, so they can correct these problems before negative impacts materialize. Identify workflow problems and other challenges that can slow manufacturing or lead to quality issues. In addition, the IIoT enables industrial-equipment vendors to offer new value-added services to manufacturers, such as automated alerts on machine status and automatic deliveries of equipment supplies. Some vendors are even moving from selling equipment to charging manufacturers based on how much they use the equipment, relying on field operating data delivered by IIoT applications. These equipment-as-a-service business models allow their manufacturing customers to avoid large, upfront capital investments, rather paying just for the use of the equipment, which better aligns expenses with value delivered by the equipment. These business models also enable equipment vendors to tailor their service offering to a manufacturer’s specific needs and use data analytics to optimize equipment-use over time, increasing equipment’s efficiency and providing additional savings to customers. In addition to transforming the factory floor, the IIoT enables manufacturers to more efficiently move materials and products into and out of their factories. A recent study estimated that $1.9 trillion of economic value could be created by using IoT devices and asset-tracking solutions in the global supply-chain/logistics sector alone. IIoT solutions that combine sensors, cellular connectivity and cloud-based tracking services can also enable shippers and third-party logistics (3PL) firms to optimize the distribution of their manufacturing customers’ finished products. By connecting fleets of trucks to a central visibility platform, shippers and 3PL firms can optimize the movement of products from a factory to the customers and distributors. Product-location/status information can also help shippers and 3PL firms speed deliveries by revealing choke points and other potential sources of delay. Shippers and 3PL firms can respond quickly to evolving traffic and weather conditions. Knowing the exact location of products can even help shippers and 3PL firms prevent or respond to theft. How can manufacturers, industrial equipment vendors, factory suppliers, shippers, 3PL firms and other companies in the manufacturing value chain realize the benefits of the IIoT for the manufacturing industry both inside and outside factories? Selecting the right partners for their IIoT digital transformation initiatives. Realizing the full benefits of the IIoT requires expertise in multiple areas, including IoT devices, cloud applications, network connectivity and IoT security best practices. Companies should work with partners that have experience in all these areas, as well as a deep understanding of manufacturing processes and supply chains. Another key is finding solutions that enable manufacturers to simplify and speed IIoT-application deployment, rapidly scale IIoT applications globally, and easily orchestrate the flow of IoT data from the cloud to edge devices (and back). For example, new comprehensive device-to-cloud (D2C) solutions use data-orchestration technologies to integrate edge device, network and cloud APIs into a single solution. Rather than cobble together an IIoT infrastructure, these solutions enable manufacturing value-chain companies to easily and securely extract, orchestrate and act on data from their edge assets to the cloud, ensuring that the right data is sent at the right time, with the right priority, to the right systems of record. D2C data-orchestration solutions enable all participants in manufacturing value chains to focus on building new and better IIoT applications while maximizing the value of the data delivered by these applications, rather than on the underlying infrastructure needed to support these applications. Tom Mueller is vice president of product, enterprise business solutions with Sierra Wireless. Want more with Tom? 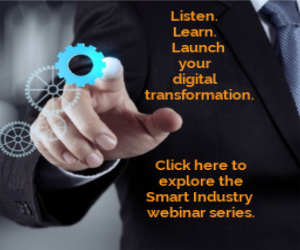 Join him during the Smart Industry webinar “Transforming Manufacturing for Growth: Gaining a Competitive Advantage with IoT.” Learn to use the IIoT to improve manufacturing productivity and safety, increase customer engagement, differentiate your offerings and generate new revenue streams. Click here to read more and register.